Well, I had a goal in mind when I started in on letter writing. My first major exposure when hunting for a way to get started was the site Good Mail Day. There I have found almost all of my regular correspondents. Misty, Limner, Laurie and a few others. These are folks I have gotten comfortable writing to and whom I'm sure could tell you I really don't have any kind of filter. You see I figure letters should be written in a way that I feel I am talking to a friend. You never hold back things from friends, because friends should never judge. A true friend just absorbs and either reacts or brushes off anything that they really don't care about. So I'm curious. How do you start conversations with new folks? Do you empty the bath water on them? Do you hold back the dirty laundry covered by air fresheners in the back room behind the locked door till the stench can't be hidden anymore? (yea I'm just spewing right now, off the cuff as it were). But seriously. How do you introduce yourself to someone for the first time? I don't have a problem telling someone my short family history in an attempt to give them the broad overview of my life. Why write about trivial stuff when the book is much better than the movie. Ever hear the term "You can't make this stuff up."? That's because the old phrase life is stranger than fiction rings so true (liked that movie by the way). So with that (and not a real good segue) I have chosen to embark on a little Hey, how ya doin' project today. I have sent out over 70 cards in one day. My wrist can testify to that one, damn thing feels like it's gonna fall off. 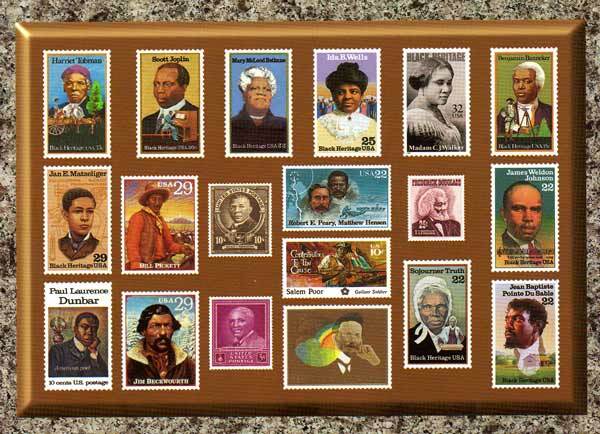 The cards are from the USPS Black Heritage Collection. I had 4 sets of cards from volumes one and two. 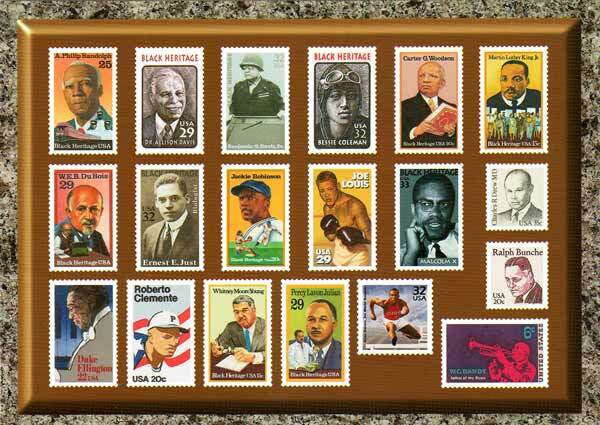 I went out and bought 40 of the new John H Johnson stamps today and they are ALL GONE. It will be interesting to see how many responses I get. The cards below Volume One and Two respectively show the heritage stamps that have been issued so far (in a collection anyway). 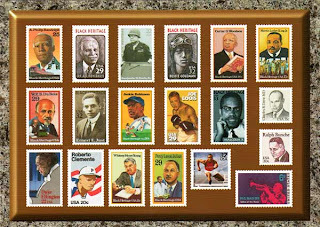 Each card has a history of the person represented and on the back it has the release date of the stamp. See dinner and a show. Now due to lack of inventory and honestly funds (hey its the first of the month). The only folks that didn't receive the cards were overseas. I plan to do this for some major days/months of the year as funding permits. Example I have one for the next major holiday planned. Opening Day April 1. Hey, Hey, Hey.. You have your holidays I have mine. Opening day of baseball season is definitely one I don't miss. I have a press pass and I'm not afraid to use it. One last thing before I let ya'll go. I have noticed that most of the blogs that cover letter writing or postcards don't have an address listed to send them something. Now maybe it's just me, but the "send a letter to get a letter" works better when I have somewhere to send it. Just sayin'. Thank you so much. Very much. A whole bunch. I got it this afternoon. :) It's beautiful! Keep an eye on your mail box. Goodness went out with your name on it. so lets see 3 days from Sacramento to Katy. Not bad. I sent out 30 on Monday and the other 42 on Tuesday. Thanks for taking the step to request my address that isn't posted. I always felt a little safer not having my address on my blog. Ironic, to say the least, that I posted my address to a pen pal forum last summer, and an inmate pen pal service found my listing. I've had multiple letters from prisoners every week since August 2011. I always wondered about the pen-pal centric sites. I wonder if the folks on goodmailday have the same issue or due to the nature of the site it flies below the radar. I know that I have stayed away from the "Pen-Pal" titled areas.